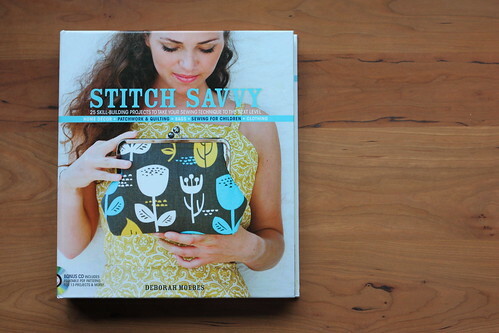 Stitch Savvy is a new book by Deborah Moebes of Whipstitch. It combines Deborah’s talent for teaching sewing with 25 projects that include home decor, quilting, bags, and clothing. Each category contains 5 projects that progress from Level 1 (basic skills) to Level 5 (advanced sewing techniques). A fun twist on the concept of building your skills is a section at the end of each chapter that recommends similar projects in the other categories that build on what you just learned. As part of the blog tour, Deborah asked us each to take a hypothetical path through the projects and share how we would leap from one to the next. 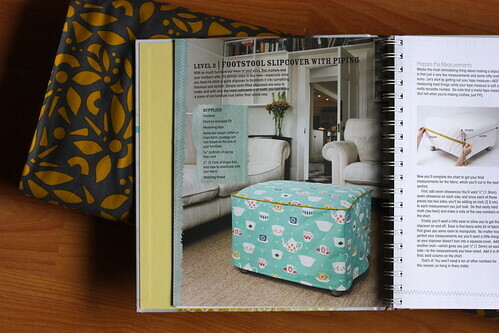 I began with the Footstool Slipcover with Piping – a Level 2 project in the Home Decor section. I’m a piping nut and I LOVED the detail that Deborah included. How to join the ends is illustrated with such detailed pictures you’re not left wondering exactly how to do each step and what it’s supposed to look like when it’s done. There’s additional info on what a piping foot is and how to use it as well as end notes on how to make a version with a gathered skirt. Next Steps is a series of recommendations at the end of each project that give you ideas of how to continue building on the skills you just learned. For the Footstool there were three recommendations: the Tea Cozy (a Level 3 project – one up from the one you just completed), a Sewing Machine Cover which also uses piping, and the Fabric Picnic Basket which builds on the technique of making clean, square corners. 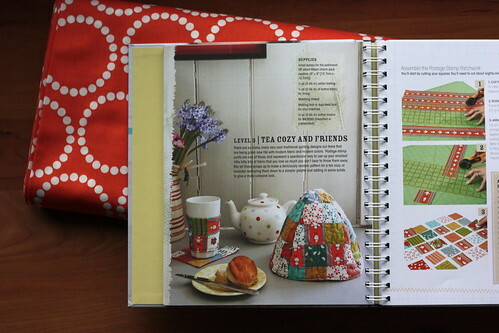 I chose the Tea Cozy project – mostly because it’s been extremely wet, rainy and cold here – the thought of a warm pot of tea under such an adorable bright cover sounded like fun! Next, I was onto the Lovie Blanket where I can use the skills I learned in sewing simple curves. The concept of making these types of jumps is a brilliant idea because that’s how we learn to sew in real life: start with one project and then up the challenge with the next, building and expanding our arsenal of sewing techniques as we go. 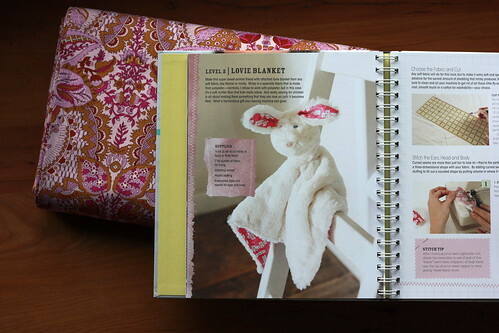 Part of the challenge of making the Lovie Blanket was using fabrics you might not be familiar with. The Beaded Clutch was a recommended Next Step project where you could work with silk. 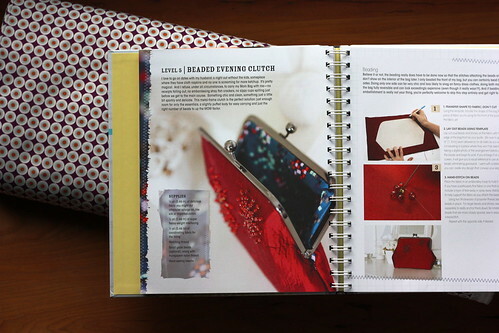 A version of the clutch with home dec fabric is featured on the cover. Now I didn’t plan it this way but I was EXTREMELY happy to see that the Knit Top was a Next Step idea after the clutch. Love, love, love this design. I’ve been dreaming of knits lately and this project definitely has my name all over it. The step by step instructions remind me of being in a sewing class where the instructor demonstrates how to accomplish the task while also sharing tips and tricks that make for a better result. 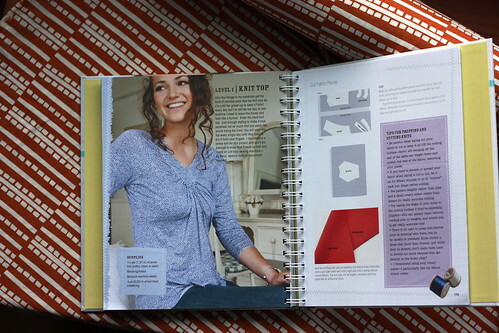 Whether you’re a beginner or an accomplished sewist there is much to learn about technique in this book. 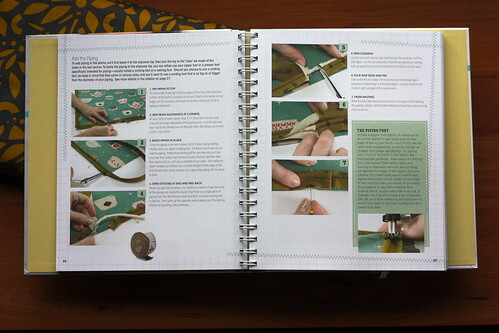 The subtitle of the book is 25 Skill-Building Projects to Take Your Sewing Technique to the Next Level. Learning to sew is a journey. One that doesn’t travel along a single path from point A to point B. Stitch Savvy presents a framework that creates endless paths all leading to the same destination: mastering sewing skills one project at a time that makes you a more accomplished sewist than when you began. Leave a comment sharing what sewing technique you would like to learn. I’m giving away a copy of the book and 2 yards of your choice of knit fabric from Pink Chalk Fabrics (that way you can make the knit top too!) Winner announced – congratulations to Lynette Russell of Sew. Knit. Grow.